NOTE TO MEDIA: Please direct interview requests or other special needs to Pat Melgares, melgares@ksu.edu, or 785-532-1160. 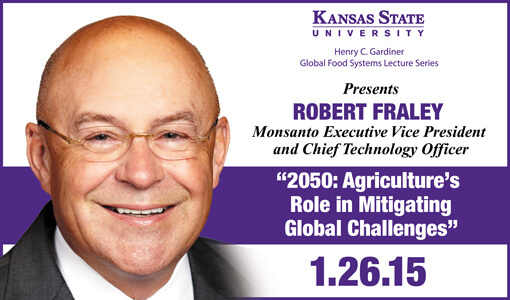 Robert Fraley, the executive vice president and chief technology officer for Monsanto, has been chosen to be the first-ever speaker in Kansas State University's Henry C. Gardiner Global Food Systems Lecture series. In 2013, Fraley and two colleagues received the prestigious World Food Prize for their achievements in founding, developing, and applying modern agricultural biotechnology. Fraley will speak at 7 p.m. on Monday, Jan. 26 in McCain Auditorium. The lecture is free and open to students, faculty, staff and the public. Fraley's talk is titled, "2050: Agriculture's Role In Mitigating Global Challenges." "Kansas State University has provided education and science to the global food system for more than 150 years," said John Floros, dean of the College of Agriculture. "Dr. Fraley is a pioneer in developing plant biotechnology, advanced breeding and crop improvement techniques in agriculture for decades. He is an excellent choice to be the first speaker in this series." In 1983, Fraley and three other Monsanto scientists were the first to genetically modify plants, and 13 years later, he helped to lead the successful commercial launch of Roundup Ready soybeans and Bollgard insect-protected cotton in the United States. By 2013, Fraley's work in this area contributed to crops that were being grown on more than 175 million hectares (more than 430 million acres) around the world by 18 million farmers. More than 90 percent of the farmers are small, resource-poor farmers in developing countries. The World Food Prize is considered the world's most prestigious award to recognize individuals who have advanced human development by improving the quality, quantity or availability of food. "The challenges facing agriculture and food production are staggering," Fraley said. "The world population is expected to grow by 2 billion people in the next several decades. This growth will present a range of pressure on agriculture, and when combined with challenges presented by climate change, we'll need to continue to find ways to do more on our existing farmland without applying additional pressures on our natural resources. "I'm confident that we can do it. The advances in biology, information technology and engineering can enable us to double food production. I don't think technology is the problem. Our greatest challenge is going to be the social and policy barriers to using all these promising innovations." Global Food Systems is an initiative introduced by K-State President Kirk Schulz in early 2014 to fortify the university's position as a leader in the global food network, which will be expected to feed an additional 2 billion people by 2050. It touches many aspects of food—including how it is grown, transported, stored, consumed and protected—as well as such related areas as family issues, nutrition, health, business, biology, the environment and more. "These goals aren't just to benefit the university," Floros said. "We want to address the global food system issues and make things better for everyone. "If we do this successfully, we can use the resources we already have on campus to meet our goals of educating others and helping agri-industries improve their capabilities." The lecture series Fraley will help launch on Jan. 26 is funded by the Gardiner family of Ashland, Kan. Henry C. Gardiner is known as a visionary leader who has dedicated his career to improving the beef industry through science and technology. Today, Gardiner Angus Ranch is a premier producer of genetically advanced Angus seedstock. For more information on Fraley's Jan. 26 talk, visit here.